Donald Trump’s campaign chairman Paul Manafort is currently under house arrest and he’s facing a dozen criminal charges that could land him in prison for the rest of his life. Even as Manafort tries to decide whether to stand trial or cut a deal against Trump, one might think that his life couldn’t get much worse. However, as it turns out, Manafort’s life may be about to get a whole lot worse, as he’s facing potential murder charges in relation to the Trump-Russia scandal. Ukraine now says that when Paul Manafort was working over there to get a Russian puppet elected, he was involved in a plot to get protesters killed for political gain, according to a Daily Beast report (link). To be clear, Special Counsel Robert Mueller can’t charge Manafort for these murders, as they took place against non-U.S. citizens outside the United States. However, Ukraine can charge Manafort and, assuming the U.S. isn’t willing to extradite him to stand trial because he’s currently too valuable to the Trump-Russia probe, Ukraine can try him in absentia on murder related charges. This complicates things significantly. 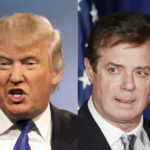 Even if Trump tries to pardon Manafort, and defeats the inevitable court challenge to the legitimacy of pardoning a co-conspirator, Manafort would still be facing a murder rap overseas. Ukraine and the U.S. do not have an extradition treaty for standing trial, but they do have an agreement regarding people who have already been convicted. So if Trump sets Manafort free, and if he then somehow gets off the hook for the state level charges he’s going to face in New York, he could still be shipped off to Ukraine to serve a prison sentence. This would mean there would be little point in Donald Trump pardoning Paul Manafort. On the other hand, Manafort might be unwilling to cut a deal with Robert Mueller unless it includes assurances he’ll never be shipped to Ukraine. In any case, the Trump-Russia scandal is now so ugly, Trump’s campaign chairman may be facing murder charges.